I LOVE her top! Its bright and beautiful! She is so beutiful mashallah. Love her style. Hey! I've linked your site on my blog! Aaaaw mashAlllah. Beautifullllll girl :) Such an adorable pretty look. I love the nice draping of the hijab, simple and stunning. ahhh standing in front of the wudu area in Ihsan Mosque - winter wudu here wakes you up! Pretty pretty masha'Allah. Top and hijab especially nice. I'm totally digging the top!! I wish I could find pretty tops like that in plus-size. There are a lot of plus size clothes out there but 99% of them are downright UGLY. Nothing like this top! Very pretty style and the photo as a whole is wonderful. I love the printed top. It matches her scarf well and also those pretty flowers above her head. Gorgeous photos, as always! That pattern of the top is just gorgeous. The shad of pink looks really nice on you. the flowers above your head are beautiful, go really well with your outfit. I love the way she wraps her hijab - and she is just stunning, mashallah! i have not quite seen someone look so beautifully adorned by a hijab before. hijabi's are simply the coolest!! 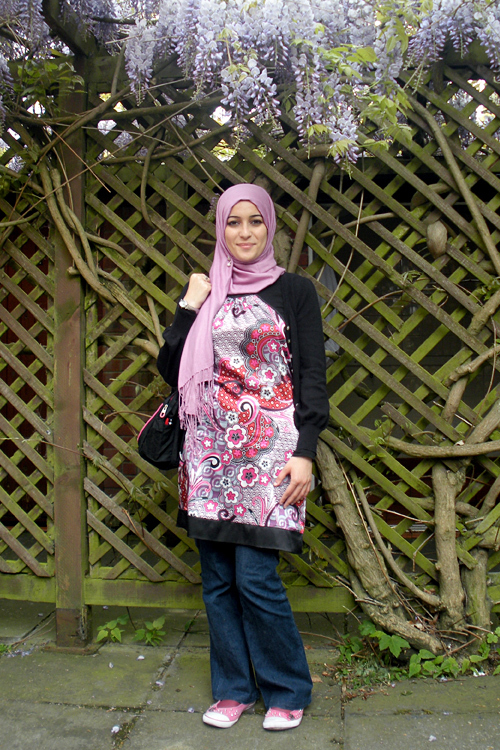 I know this sister and have been to the mosque she is standing in front of... She looks marvellous and I love the patterned top!